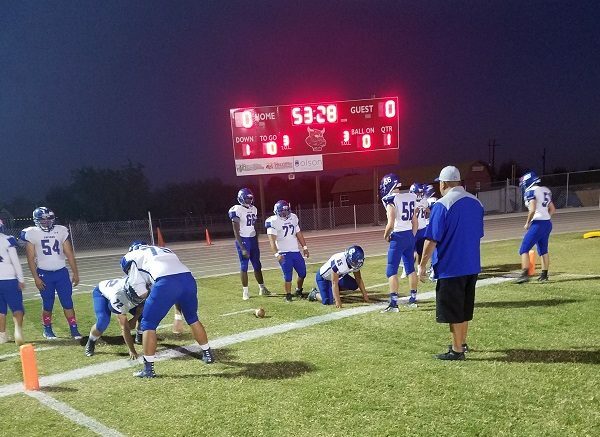 The Safford Bullodgs showed their muscle early and often Friday night in their 34-0 upset over the Minotaurs. Robert White scored on the 3rd play of the game on a 51 yard touchdown to silence the raucous crowed. The Dogs didn’t give them much else to cheer about either as they dominated the first half with two more rushing touchdowns from Sam Tobias and CJ Scrivner. Scrivner added two more scores as well and ended the night with 192 yards and the three touchdowns. The Bulldog defense held OI’s leading rusher Chris Weaver to just 124 yards. He averaged 225.6 yards per game in the regular season. This is the 11th straight game he rushed for over 100 yards this year. Safford will travel to Yuma on Friday to take on #2 Yuma Catholic, who defeated Show Low 49-20. The game was close at halftime but the Shamrocks held the Cougars scoreless in the 2nd half to pull away with the win. Thatcher had little to no troubles with NPP at home Friday. They scored early and often on offense and special teams. Brock Jones opened the scoring with 20 yard run early to give the Eagles at 7-0 lead. Quinton Turley got in on the fun with a 10 yard run with 90 seconds left in the 1st quarter to make it 14-0 THS. On the ensuing kick of the Falcons failed to cover a free kick and the Eagles capitalized with a run from quaterback Jack Kortsen and a 21-0 Thatcher lead with still 70 seconds left in the quarter and the route was on. Thatcher would add touchdowns from Bretton Dodge, Turley, Trevin Clark, Kortsen, Javan Montoya and Trace Goodman to round out the route 56-0. The Eagle defense held the Falcons to 93 total yards. Thatcher will host #9 Benson on Friday at 7pm. The Bobcats won a thriller at Alchesay 46-42. The Eagles defeated Benson on September 14th 48-6.